At Radius Osteopathic, we offer a combination of dry needling and osteopathic treatment methods to help any patients who are suffering from tight muscles and other related injuries. 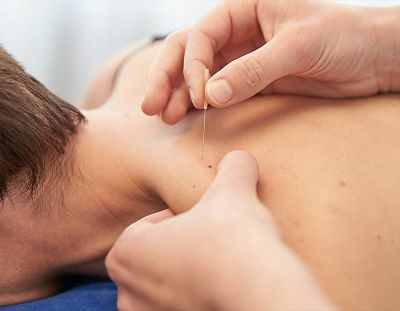 Dry needling is a form of treatment we employ at Radius Osteopathic, which involves the use of fine filament needles. Combined with osteopathy, dry needling is a form of treatment that’s used to release Myofascial Trigger Points as well as any instances of tight muscles. Myofascial Trigger Points can be very painful, and are usually identified by a localised ‘lump’ or knot felt in a patient’s muscle tissue. Although muscle knots occur commonly, that doesn’t mean that it’s always harmless or normal when they happen. Muscle knots can happen for a variety of reasons, and these include chronic stress on the muscles. If left untreated, these muscle knots can cause a person’s muscle tissue to lose their elasticity and even cause hard to reverse postural stress. Whenever a patient’s muscles are chronically irritated or shortened due to tightness or contracture, tendons can also experience irritation. This could lead to tendonitis. Placing a filiform needle in either a shortened muscle, or on a Myofascial Trigger Point can stimulate healing responses. These responses are what release, lengthen, deactivate or desensitise any of a patients’ affected muscles. In many cases, patients are able to report feeling improvements to the range of motion they are able to experience. With a patient’s joints, muscles and other affected area of myofascial pain addressed, it is common to associate trigger point dry needling with the effective treatment of muscular pain and dysfunction. Dry needling is a procedure that can be performed within our clinic. Little or no pain is felt when a filiform needle is inserted into a patient’s skin directly into an Myofascial Trigger Point. Myofascial Trigger Points consist of hyperirritable spots that are related to the production and maintenance of the pain cycle. Proper dry needling of an Myofascial Trigger Point usually creates a local twitch response, which is an involuntary spinal cord reflex that sees the taut band of muscle contract. What the local twitch response indicates is a proper placing of the filiform needle at a trigger point. Dry needling with local twitch responses improve treatment outcomes. Should You Worry about Pain during Treatment? Most patients do not feel the filiform needle pierce the skin. During dry needling treatment, some discomfort could still be experienced whenever a needle enters a very tight muscle. Patients may commonly experience a twitch or muscle cramp – however, this is a great sign that often indicates an otherwise tense muscle is about to relax. Muscular soreness and occasional bruising are the most common side effects associated with dry needling treatment. Patients who experience soreness lasting more than a couple of days are always advised to consult with our practitioners. Sonja Michelini (Remedial Massage Therapist). At Radius Osteopathic, we use dry needling as part of our osteopathic treatments and methods. Along with professional treatment, we continue with the assessment and diagnosis of each individual patient, to identify their cause of pain and to develop a suitable treatment plan moving forward.